The 2018 Honda Fit was revealed early this week, showing more youthful, fun, and emotional styling. These updates only serve to enhance the Honda Fit’s sporty character. The Fit also boasts upgraded features which add to the best-in-class space, refinement, practicality, fuel efficiency, and affordability. The refreshed Honda Fit sees the introduction of a Sport trim, as well as introducing the availability of the Honda Sensing® suite of safety features and driver assisting technology. The Honda Sensing® suite comes standard on all CTV trims for the 2018 Fit. The suite of advanced safety features includes Adaptive Cruise Control, Collision Mitigation Brake System™, Lane Keeping Assist System incorporating Lane Departure Warning and Road Departure Mitigation incorporating Road Departure Warning. The Honda Sensing® suite adds to the Honda Fit’s best-in-class rating, giving it the most comprehensive suite of advanced safety and driver-assistive technologies in its class, Canada wide. The Honda Fit has been upgraded to feature a new, sportier style. The 2018 model features a horizontally layered, two-piece chrome and piano black grille with a larger, more prominent “H” mark. The headlights blend into the side edges of the upper fascia’s wing. Having these headlights integrated in this way creates a more aggressive design and feel for the front of the car. The front bumper also adds to this aggressive design, with top chrome accents and a full-width splitter, with the addition of more angular fog light pods. The rear continues the sporty styling, featuring a redesigned bumper with a full-width character line in piano black, as well as a splitter-shaped lower section. The tail light combo has been newly styled as well. 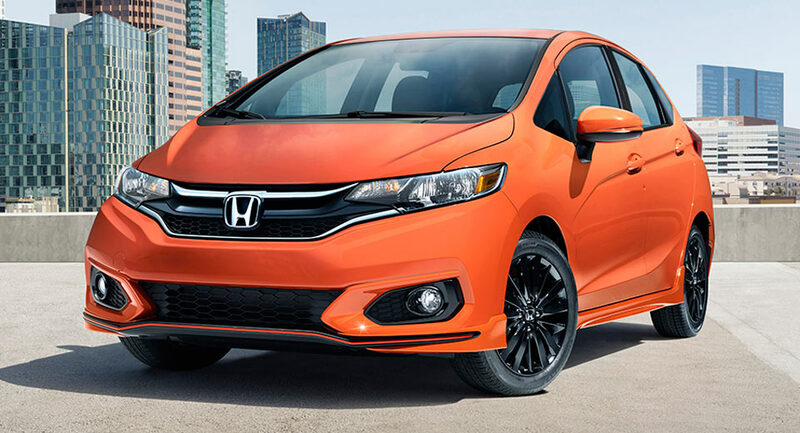 The Fit Sport trim enhances the aggressive and sporty look with aero form features all over the car, from front to back, and a low sharp front splitter which is highlighted in bright orange. The 2018 Honda Fit is newly available in Orange Fury, along with previous model standard colours: White Orchid Pearl, Modern Steel Metallic, Crystal Black Pearl, Milano Red, and Aegean Blue Metallic.